Zephyr's small size makes it great for taking on the road, but it's still big on performance. Zephyr is fully automatic, just like its older Dry & Store siblings, and it ships with the Dry-Brik II disposable desiccant, the new standard in moisture absorption. Zephyr operates on an 8-hour cycle, and it also utilizes warm, moving air and a desiccant, proven technology for maximum drying effectiveness. A disposable Dry-Brik® desiccant is included with each Zephyr. This custom desiccant contains an aggressive sorbent and also absorbs odors as it dries. Each Dry-Brik has a shelf life of at least one year, unopened. Once the foil label is removed, the Dry-Brik II lasts two (2) months. Great improvement for hearing aids! Sturdy. Lightweight. Easy to use. Portable. Excellent job or removal of ear wax. Aids function better and for a longer period of time. Hard to open. Short warranty. This is a replacement for my Global model, which was larger than necessary and stopped working after some years of faithfully caring for my hearing aids. 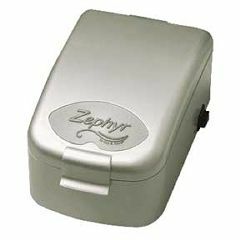 Aids are a huge investment; the Zephyr is a less expensive and more compact device that seems to be doing the job just as well. I live in a hot climate, often triple digit temps, and rely on Dry &amp; Store to protect my aids from moisture damage. My hearing aid is working much better! I play softball, horseshoes,and volleyball.Generally I live a pretty active lifestyle. My hearing aid was constantly giving me problems and I kept going back to the MD for adjustments.I was contantly using compressed air to blow the thing out.Finally, it was mentioned that maybe the hearing aids were getting wet. Since purchasing this unit, I have had no hearing aid problems. Compact and works really well. by OHROADKING from Huntsburg Oh. My ear Gloral Dryer ha light in the top of the ccase and needs a new one. where do get one? Where can I find a class 2 transformer to fit my hearing humidifier? Asked on Aug 11, 2012 9:47:58 PM by Brownie from Williamsport,Ind. I need one. Did you find one? Mine is sparking where it plugs into the device.